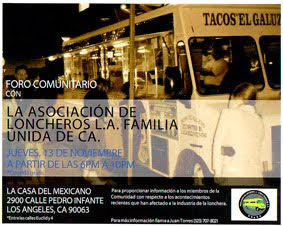 Whenever I would be coming back from a taco crawl in Highland Park or Eagle Rock I would drive past this taco truck that parks in the lot of a Carniceria at Cypress and Granada St in Glassell Park and see the chickens grilling on the outdoor BBQ's. The smoke would be billowing into the summer sky and the delicious smell of those chickens would always somehow sneak into the car and stick to my nostrils. "Next time" I would tell myself and like a cruel joke this scene played out over and over again. I'd be barreling down Cypress Ave and then see the smoke rising in the air and I'd say "the chickens!" and then the smell would hit me and I'd start cursing myself for forgetting about them. 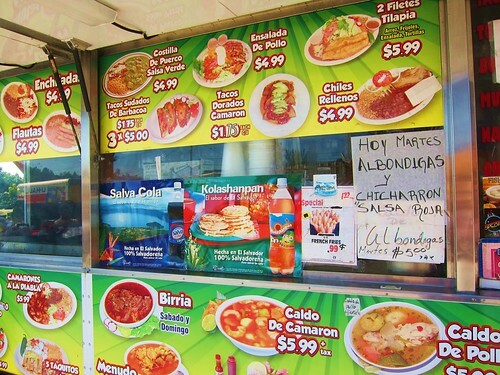 Well there were no outdoor chickens this day (it may only be a weekend thing) but I was hungry and I was curious what kind of antojitos I could find. The menu was extensive and it was unclear what the specialty was or even if there was one. So in my best Spanish I asked the girl inside the wagon to make me up a plate of 3 tacos. At first she didn’t understand what my request was and started to ask what kind of tacos I would like. I figured I should try chicken and then suggested that she make me a couple of dorados. The girl taking the orders had a conference with another woman in the truck then wrote up the ticket and told me to pay inside. Once inside I found my new favorite flavor of Jarritos, Guava. 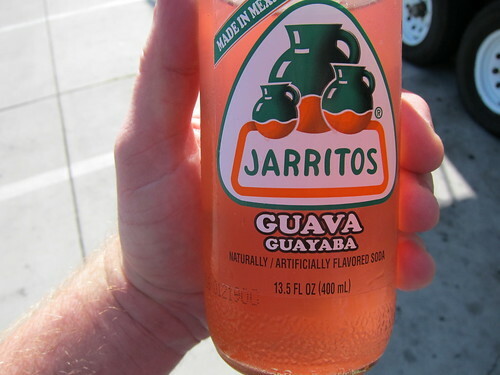 Guava jarritos has supplanted lime jarritos as my favorite drink with tacos. There’s a lot of punch to it and the sweet taste of guava hits the spot. My total came to $4.85 including the jarritos. I thought it would be more and I was curious what kind of tacos awaited me. 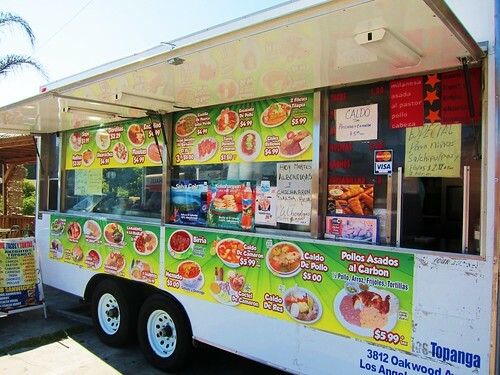 Once I got back to the wagon my tacos were ready and I took them over to one of the tables next to the wagon. 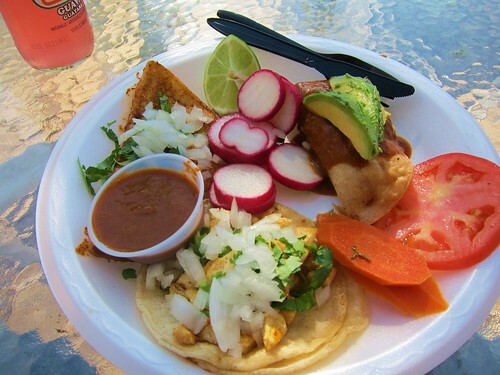 I peeked into both dorados - barbacoa and shrimp, and then ate the chicken first. The chicken was tender char grilled chunks of pollo. The salsa that came on the plate was spicy and sort of reminded me of King Taco salsa. All the chicken needed was a squirt of lime and a little of the salsa. Next I ate the shrimp dorado. 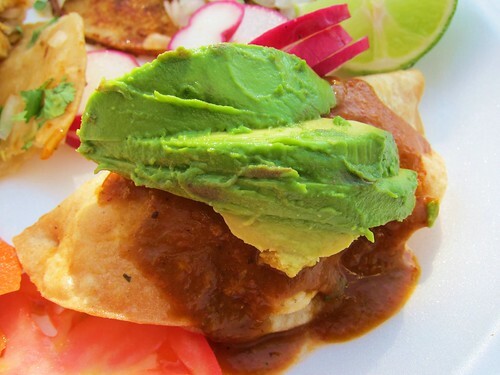 The taco was covered with salsa and topped with avocado. It was delicious. The inside was cool and refreshing and the avocado was the perfect compliment to the shrimp. The barbacoa dorado was disappointing simply because the shell was not crispy at all. It was soggy. I’m not sure what happened but I just discarded the shell and ate the meat with the fork. It was goat and it was quite flavorful, I only wonder how good it could have been if it were a true dorado. All in all the plate of tacos and the bottle of jarritos for $4.85 was a steal. I can’t help but wonder if my unorthodox ordering method landed me a discount somehow. Or maybe they saw my camera and thought I was from the internet.